Talking about these things hasn’t been easy for me. For the longest time I chose to suffer in silence. I thought that revealing this part of my life would bring up unwanted assumptions, and I didn’t want to allow that. We all have problems, right? I’m in a different place of healing now and I want to now in turn help someone else who is at the point in their life where it feels like nothing else is left to give.. that there really is hope. I am going to be blunt and start this off by explaining my frustrations in my experience of dealing with the medical field in general. I can’t say that every hospital and doctor is ignorant to the whole mental health scene. But in my opinion, a lot of them are. Since going through this myself, I have realized how many many people are suffering—and with a condition that the doctors themselves can’t put a name to. And months, years, many tests and procedures later they still are left with no answers. I can’t imagine how many others out there must be suffering with anxiety the way I have. Anxiety has always been everpresent in my life and in different forms through out different stages of my life. It was 4 years ago that I started experiencing unexplainable pain and sickness. I remember the very first night that it took control over me like it had happened yesterday. Ever since, I have undoubtedly changed. Anyone who knew me before—knew that something was different. I, my social self, had turned into a hermit. I no longer wanted social interaction although it was what I craved. Anxiety had won, and it undeniably took its hold on me. It literally came like a thief in the night and my ability to remain somewhat calm had completely vanished. I felt like a whole different person from that day forward. Because every day, every night was an anticipation in my heart of what was to come, and I was terrified. Every single doctor and specialist I have seen has been completely uneducated on what I have gone through. I had been labeled as crazy at one Emergency Room that I attended on a daily basis at the time. To give you guys a little insight.. Jordan and I have never had a babysitter. We don’t do daycare (many personal reasons), and we have never had any help from family or friends. We had our two older children at the time and the hospital was no place for them. So when I had to go to the ER, i had to go alone. Being in the ER completely alone during times like this made me so vulnerable. Nausea and vomiting became my two best friends. I was unable to speak most of the time. To communicate at all what was wrong while i was shaking violently seemed impossible at times. From my experience, these moments of vulnerability opened my eyes to just how misinformed our local hospitals and doctors are to what I And possibly many others were going through. I knew it couldn’t have just been here in Montana, either. I know we are behind on a lot of times up here in the NW but I was doubting that medical treatment would be one of them. this is actually a huge nationwide problem. The hospital that I went to when I was panicking had labeled me as crazy after seeing me just a handful of times. It had gotten to the point where the nurses and doctors demeaning and rude behavior towards me were the least of my worries. Jordan had dropped me off one time and from what I could see in the waiting room, I was the only one in there. They did the normal triage as best as they could—I was always hyperventilating so bad that they could NEVER get a blood pressure reading on me with the machines, but they always had to try.. while cutting off my circulation in the process. Frustrating for a person like me who had previous years in nursing school and actually had to learn to manually do a blood pressure reading-without a machine. Anyways, as soon as I was triaged, they put me in a wheelchair with an IV bag of fluids and put me in a dark room- aside from the waiting room. Not a hospital room- more like a closet. With nothing in it. After multiple of these same horrific incidents of being drugged up with anti psychotic meds and being mistreated by not only doctors but nurses too.. pretty badly.. I finally quit going to that ER—no matter how bad I felt. Because not only was my anxiety fueled by my fear of my attacks but now I was also in fear of my local hospital. 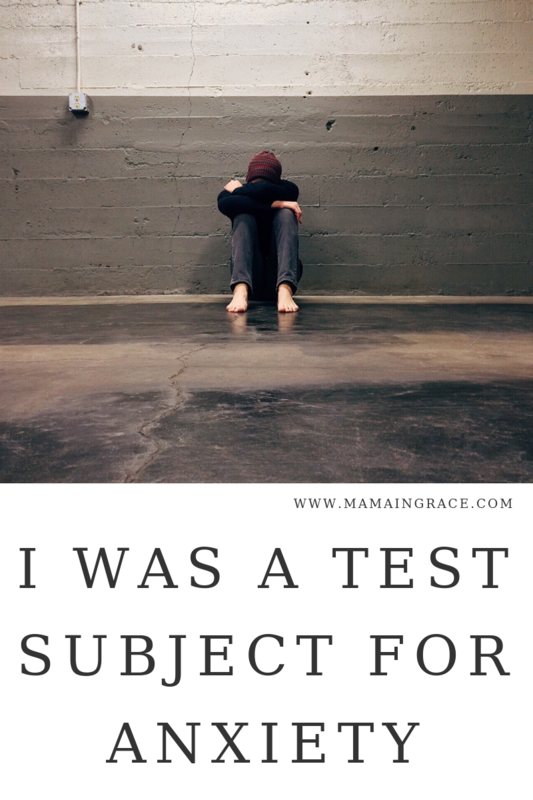 After weeks and weeks of feeling like I was literally dying and being ok with the thought of it, I woke up one day determined to find out what was wrong with me. I wanted to find healing. I sought out all naturalists, specialists, therapists, and new doctors to bring on board with me to try and solve this puzzle my life was in. My mind wanted to know what was making me lose sleep. What was making my heart race, sick to my stomach, violently trembling, and continuously throwing up because I knew it wasn’t right. Unfortunately had to learn the hard way and had listened to what the doctors had told me to do while they were playing their guessing game on what was wrong with me. They prescribed a bunch of medications that I never took for very long because of terrible side effects. I had 8 different CAT scans total the year 2016. Almost one every few weeks it seemed. There was a multitude of long and drawn out tests that all lead me to a conclusion that my body was actually very healthy. What needed healing was truly so confusing for the longest time. Everything ruled out food allergies.. everything I felt like. I was told multiple times I was crazy and that I resembled signs of a drug addict. Anyone who knows me well enough knows that I would never ever touch an illegal substance or even think about taking a “drug”. I had watched the effects of drugs for far too long to be smarter than that. Obliviously my blood and UA tests showed otherwise, so I was never too bothered about it. But I thought that the assumptions were completely unfair and unprofessional. I was already missing my appendix from years prior so that was knocked off the list, they removed my gall bladder and that didn’t help so I was diagnosed with gastroparesis..
Gastroparesis has been my “ medical diagnosis” and is in my medical charts as so. To this day- I disagree with and have proven to myself and others that I do not have this horrible disease—which is also something that needs more awareness.. lots of sufferers and no available treatment=devastation to many. Gastroparesis is even more devastating and if you have never heard of It before, check it out here, just to be aware and help raise awareness if you can. It breaks my heart because if I wouldn’t have built up the courage myself to seek out other help, my life could have been ruined forever. The gastro doctor I had seen wanted to put a feeding tube in my stomach because I was so sick everyday. I couldn’t relax, I couldn’t eat, I couldn’t sleep, I couldn’t do anything. I was dying from anxiety, and didn’t even know it. If anyone that knew me seen me during this period of time they would have thought the same thing. I didn’t take many pictures of myself- ashamed at how different I looked. I was literally awaiting my day, anxiously.. because I knew it was coming. Unexplained anxiety comes from out of no where sometimes. When it comes, it does come for a reason and it never truly goes away until you find that reason yourself. Healing has to be something you want. Otherwise everything you do to treat it will just be covering up what is actually wrong. I don’t know it was my internal intuition or if it was the Holy Ghost speaking to me daily. But something in me knew that My body was healthy. Regardless of what the doctors had said, i knew i wasn’t all crazy. And a slight bit of myself that didn’t want to listen. I didn’t want to believe that I was another young person in her twenties losing her life slowly but surely, right in front of her husband and kids. I’m telling you right now from experience that finding the right therapist takes a lot of work. You have to want to invest in yourself enough to make it happen and to find the right person. FYI– finding the right therapist does not mean finding someone to talk about all of the current drama going on in your life, every time you walk in their office. I have had a few of these.. they are absolute time wasters. Whatever you feel the internal need to do to help yourself and the healing process, just do it. For me that was therapy. If you do go that route, find a therapist that wants to invest in listening to not just your present, but your past and your future as well. Like me, you may be really shocked once it’s pinpointed to an incident that happened as a child. Maybe its what a lot of this has stemmed from. One thing we do all have in common is that we all have those experiences. It’s just that we all haven’t experienced the breakthrough from dealing with those experiences. I thought that I was the abnormal one. My problems as a child had never been addressed the way they could or should have been. Which I think just built up over time. The truth is that our world these days has made it seem that anxiety disorder in general is a common problem most of us face and know how to deal with, yet a lot of us refuse to talk about it and deal with it on our own. Which actually helps zero people. People think of anxiety as breathing deeply into a brown paper bag.. for some of us, it’s SO much more than that. Most of us who live with anxiety are labeled as depressed. I can say for a lot of us that most of the time, we’re NOT depressed! But even if you are suffering with depression and anxiety.. i just ask what you are doing besides just taking medication? The medications do work for some, and I don’t want to take that away from anyone else’s story.. but for me it was different. I needed to find healing from deep down within. I went down that road of medications too, and it made things much worse in the bigger picture. Mind body and soul go together like gas and oil in an engine. We need to take care of all three before we will get anywhere. My therapist who specializes in trauma and abuse has been the only one to listen to me and actually help me. He agrees with my method of treatment with absolutely no medications. If I have any control over the medications I take I will do my hardest to make it so I don’t need any of them. I want full control over my life. Our bodies and minds are powerful. What we don’t realize most of the time is how much control we really do have. Deep breathing exercises, regular exercise, EMDR therapy and bi-lateral stimulation are in my tool bag of personal treatments I use on a regular basis. We can all find a form of healing within ourselves. Listen to yourself. Listen to your gut, because I can promise you one thing—that there is hope. It’s for sure a process, but nothing you cannot do. If you too are struggling, I encourage you to take the most current help you can get in whatever form that is. Take it and run with it! Run as far as you can whether that be baby steps at a time. Start somewhere and most importantly don’t give up on yourself. Anxiety can lead to depression and depression leads to unwelcomed thoughts, and fears. I don’t wish anxiety or the ill effects that go along with it onto even my worst enemy. Look at your suffering as a blessing—one that can be learned from. And you can’t heal from something when you don’t even know how or where to begin. In sharing my experience with the living hell that anxiety can bring, my only hope is to encourage someone else to get the help they need. To know more and to know the signs of Anxiety visit this website to see what you can do to help yourself or someone you love and care for. And whoever it is that you know who may be suffering, they need to know they are not alone, too. Wow, thanks for sharing your heart. I’m sure this will help many others who are dealing with anxiety. There is hope for everyone in Jesus Christ. By the way, I’m an introvert, too.